The P & O Australia Cruises ship ' Pacific Eden ' should have sailed from the Australian port of Sydney last night on a five day cruise. Today she still remains in port and there has been no news on the delay. 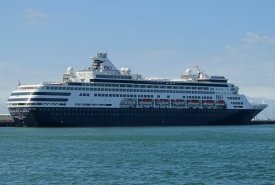 Picture of the 55,819 grt cruise ship attached which is another old cruise ship which last year was transfered to join P & O Australia fleet of old cruise ships having previously been sailing with HAL Cruises since she was built in 1993 !